Respected New York Art critic Jerry Saltz has revealed the Top 10 Art Shows of 2010 in the New York Magazine. In his run down of exhibitions, the Guggenheim certainly has something to celebrate this year, with the top two positions being filled with exhibitions of their making. Here's what Saltz had to say on the New York art scene for 2010. Curated by guest curator, and art history icon, Kenneth Silver, this exhibition is on at the Guggenheim at the moment, and runs through until the 9th January. The exhibition looks at art from France, Itally and Germany between 1918 and 1936. A period buried in the horrors of World War I and in which society is trying to get to grips with what art should be about and how society can moved forward after such atrocities. Saltz comments that "Thanks to [Kenneth Silvers] show, we have a clearer, less formalist idea of what was going on across Europe between the wars. As we've long suspected, art didn't simply march forward from Cubism in the teens, through Dada and Surrealism in the twenties and thirties; it made some strange pit stops along the way, into an often disturbing realism." In complete contrast to the Chaos and Classicism exhibition, This is Progress relied on the gallery environment, gesture and the subtlety of the lived experience for its impact, rather than on any physical objects. You would be accompanied by an actor, for a walk up parts of the ramp at the Guggenheim and able to interact in conversation with them. What Saltz loved; "That Sehgal's creation - as real as the Mona Lisa - offered such an expansive and moving (emotional and physical) definition of art"
Curated by Robert Gober, this exhibition re-exposed the audience to the American visionary Charles Burchfield. In his primary subject matter of landscapes, Burchfield leads us on a unique and often mystical tour of the things that surrounded him in his life. As Saltz puts it "[Burchfield turned ordinary things into errie...utterly original, even magical art." 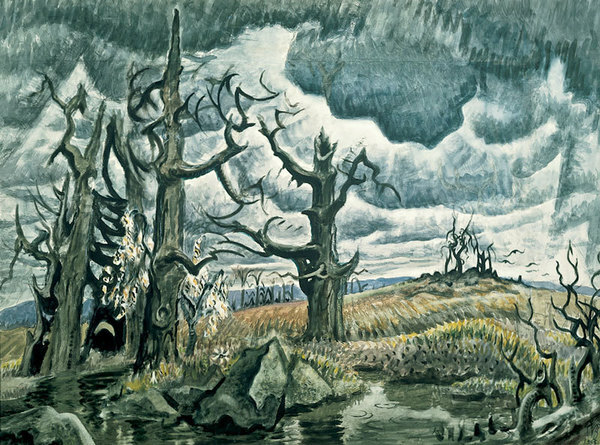 Charles Burchfield, An April Mood, 1946–55. Watercolor and charcoal on joined paper, 40 × 54 in. (101.6 × 137.2 cm). Whitney Museum of American Art, New York; purchase with partial funds from Mr. and Mrs. Lawrence A. Fleischman 55.39. 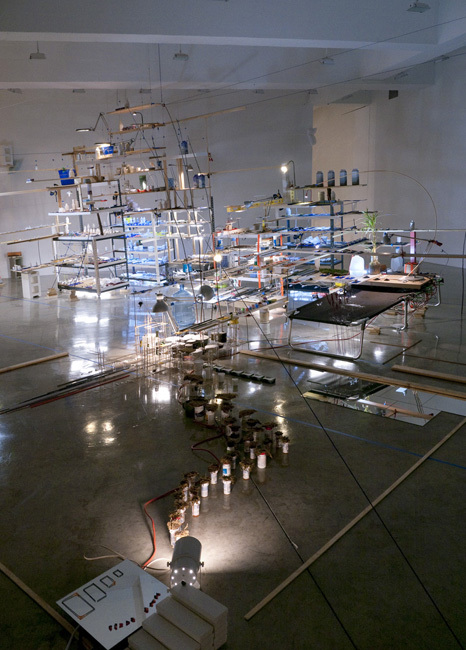 Sarah Sze is always an interesting character, with her immense creations compiled out of found and everyday objects. You never quite know whether her structures are to serve some purpose or meet a desired goal. Whatever form they take, they are endlessly captivating. In September / October this year, Sze exhibited across two storey's of this gallery, leaving little space left unexplored or "transformed into the abstract machine" that is typical of Sze's oeuvre. With 6 more shows making it onto Saltz top 10 list, head over to the New York Magazine website to read about the rest and find out what Saltz had to say. Also, why not let us know what you favourite shows of 2010 were, and why.